We offer horseback riding lessons to children and adults of all experience levels. We teach a variety of disciplines with a focus on balance seat, jumping, dressage and low level eventing. Our riding lessons focus on general horse care practices, safety with horses and riding to educate our students in all aspects of horsemanship. As part of the lesson, students learn how to brush and properly saddle and bridle the horse. Most of our horses are available for 1/4 and 1/2 leases. Monthly leasing starts are $120 per month. We also offer practice rides to students who not want to commit to leasing but occasionally want to ride without instruction. Practice rides are $32. 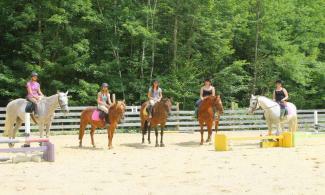 Showing, trail riding, and beach riding is available to all of our students. Check out our Horse Care Club page for children 4-12 that are looking for quality hands learning with our horses and farm animals. This program is run similarly to our 4H program but for our younger horse lovers.